Taipei is the perfect base for kitesurfing trips. Indeed, within Asia, it’s probably the capital with the best kitesurfing conditions given good winds and its geographic position. The location in the north of Taiwan provides easy access to the western, northern and eastern shores of the country. The core wind season is during the north-east monsoon from October to March, but windy days of 20+ knots are not uncommon during the off-season summer period. Note that there is a brief rainy season in late May/June and that there are occasional typhoons during July-September which make kitesurfing impossible. Although not absolutely required for all of the locations presented below, disposing of a car or scooter will be very helpful when organizing a kitesurfing trip from Taipei. Assuming that you do have a vehicle, several attractive kitesurfing spots can be reached within 1 to 1.5 hours from the city center. In addition, kitesurfing is not a very popular sport here, so you will have plenty of space and on the water and to setup equipment as beaches are rarely crowded. What follows is an overview of my five top spots kitesurfing spots around Taipei. At just under an hour’s drive, the Red Beach is the closest spot from central Taipei. It’s located by the river mouth of Danshui (淡水 or Tamsui) river, on the left river bank in an area called Bali (八里), facing the Taiwan Strait. Danshui district (淡水區) is located on the opposite, right bank of the river and can be reached by the MRT (Danshui Station). I am told there is boat connecting the two banks. The site has an industrial feel as port cranes are not too far off and you can spot a factory or two once you are on the water. But otherwise the beach is wide with plenty of space and quite pleasant. There is a large flat water area closer to the river mouth once the tide starts falling. Perfect spot for the summer south-west wind. A local kitesurfing group operates basic shower facilities by the parking lot for members. GuanYin beach is located in Taoyuan(桃園), about 1.5 hours drive from Taipei and about 20 minutes from the Taipei’s international airport. It’s a good spot with plenty of space and a nice surrounding (if you don’t mind the wind turbines) and suitable for kiting all year round. DingLiao is about 1.5 hours away from Taipei by car. You will need to bypass the YangMingShan National Park on the south-eastern edge and follow the road to Yehliu Geopark(野柳地質公園), which features the iconic Queen’s Head (女王頭). The DingLiao beach is about two kilometers up the coast from the park. The views re great as the mountains meet the sea here. It’s best during the winter north-east wind season (October-March). Baisha beach is a popular day-trip destination during the summer as it’s about 1.5 hours from Taipei. The name literally means “white sand bay” and it is indeed located in a large bay between two capes. It is suitable for kitesurfing during the winter months, when the wind blows from the north-east. There are a few cafes and snack bars by the beach and this spot can actually be reached by public transportation. You must first take the MRT to Tamsui station and then bus 622 or 623 (slower), or 1261, 1262, or 1263 (which are long-distance and faster). You have to alight at the Baishawan stop (白沙灣) and you can already see the beautiful bay. Neipi is possibly the best spot in northern Taiwan during the off-season summer moths (beach is south-facing), although it’s relatively far away from Taipei as you will need to drive for about 2.5 hours. It’s in the town of Su’au, which has an large fishing port and an impressive fishing market. The drive is well worth it – the bay offers great kitesurfing conditions and beautiful views. The trip to the nearby town of Dong’au (about 20 kilometers) provides great scenic views of the coast. Check out this live feed from this amazing beach below. See any kiters in action? 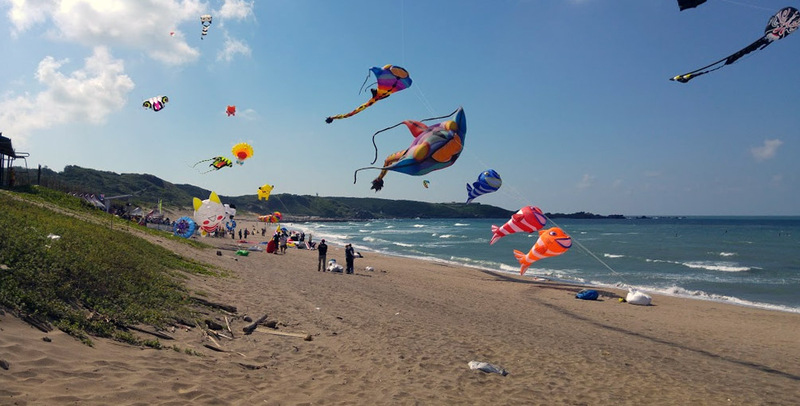 The entire coast of Taiwan is dotted with kitesurfing spot and even for the northern part of the island the list above is not in any way exhaustive. Outside of Taipei, I find the kitesurfing in Penghu deserves special attention – especially if you are not afraid of strong winds (25-40 knots). Great article – thanks! How easy is it to hire kitesurfing equipment around Taipei? As far as I know there isn’t an established shop or company that do equipment rental. There are however, one or two local guys who rent equipment and usually sell equipment too. I don’t personally know them, so will refrain from making a recommendation, but I have heard their names brought up in conversations.